It seems almost fitting that my experience with the first part of Dark Souls 2’s Crowns of the Fallen Kings DLC trilogy – Crown of the Sunken King – began with all my equipment broken. I was given control of a standard warrior archetype wielding a Longsword and a shield, only both of those things were completely busted. All I had left was a large hammer or a Zweihender; two weapons I have no experience with. All this in a cavern rife with precarious walkways, numerous holes, and archers galore. This is Dark Souls, all right. The level itself didn’t have much to say, though. Its architecture was interesting, but I didn’t find much in the way of lore. A single spell known as “focus souls” was the only glimpse I found. It alluded to the practice of magic being forbidden in these parts, yet still it thrived in spite of the ban. Stories like this are what make Dark Souls’ world so fascinating. The dearth of info so far was disappointing. Perhaps there will be more in the full version. The most noteworthy thing was the multiple paths through it. The area at times felt a little confusing, never pointing your toward a single way forward. I often found myself at forks in the road that led me to jumping across the tops of pillars, either to get the drop on foes or to bypass them altogether. It’s a very vertical level. I was always either climbing up or falling down. It felt very small, though. It didn’t take long to get to the “end” of the area, a stone door standing at the end of a long bridge. I and another press member tried to puzzle out how to open it (was there a switch we missed? ), but to no avail. The Bandai Namco representative on-hand was tight-lipped about it. The structure it was attached to was large and vaguely suggestive of it being the home of the boss of that area. I hope that’s not the case. Dark Souls’ Artorias of the Abyss DLC was fantastic because, short as it was, it felt complete. It flowed from one area to the next seamlessly, tossing a great batch of boss battles at you along the way. This felt like a single level add-on. 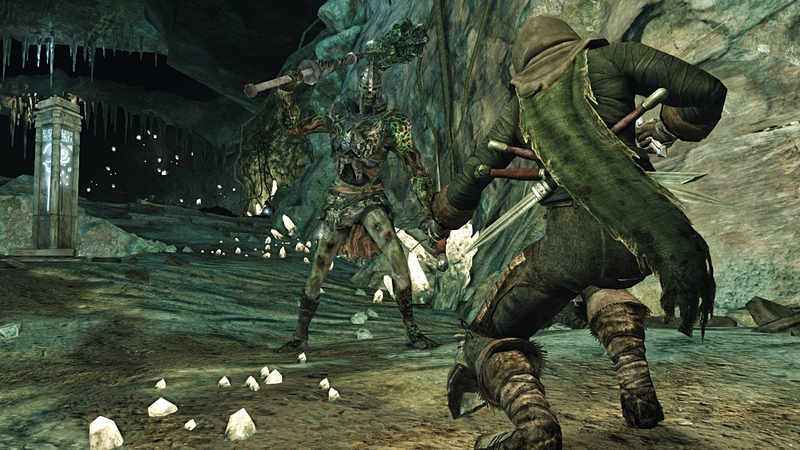 Don’t get me wrong – more Dark Souls is good regardless of what form it comes in. But right now, I question the purpose of making it a trilogy, especially if that really was the end of the area and if the other two will be of similar size. I’m hoping there’s more to it than what I saw, that it all comes together nicely and can justify the episodic approach. The level was fun to play, and I’m certain the other two will be as well. I just hope they can deliver more than simply another set of Dark Souls levels.